Greek charter company Ionian Charter started operating 26 years ago and today is known for its quality service. During the years of a success path, they have developed a unique approach and put an extra personal effort to ensure a holiday that clients want to experience again. Booking Manager saved us a lot of time and effort by directly connecting to new agencies worldwide. It is the best way to promote our company and fleet, which is why are we using it as an exclusive booking system. Ionian Charter operates in Greek yacht charter business for almost 3 decades with the main goal to provide remarkable customer service and yachts in excellent condition. Their wide offer consists yachts from various shipyards such as Jeanneau, Beneteau, Bavaria, Bali and Lagoon. The Ionian Charter Team proud themselves on the rising number of repeat customers. Continuously reaching to customers for feedback to provide a valuable insight resulted in offer and service tailored exactly by the client needs. Therefore, Ionian Charter has carefully selected their fleet, that nowadays consists of very well maintained 16 yachts, ranging from 37 to 50.5 feet. The quality of their yachts, the reliability of offered services, combined with moderate prices is their formula to achieve customer satisfaction and loyalty. Each charter is precious to Ionian Charter team, which is German, English and French speaking and will friendly welcome client at the base. They work hard all year long to prepare everything for the most beautiful time of the year - the sailing season! By giving a special attention to customer desires, Ionian Charter offers various one-way routes to some of the most attractive sailing points of divine Greek coast. The home port of the fleet is Alimos Marina in Athens, but guests can choose among different one-way routes to Lavrion, Lefkas, Corfu, Kos, Rhodes or Skiathos. This is a great opportunity for all those clients who fancy untouched nature and hidden coves, not really discovered by the mass tourism. The advantage is strengthened by conditions favorable for sea traveling: Greek seas are considered safe, distances between coasts are small, while conditions related to wind strength, ambient and sea temperatures are equally favorable. At the time of company founding, small Greek charter companies needed to overcome many challenges in order to successfully position among competitors on the market. Back then, it was expensive and not so simple to communicate directly with end customers and promote fleet. The bookings were often closed in cooperation with larger agencies and that lowered speed and profit of the business deals. With the great effort spent in customer service for each client, year by year, Ionian Charter has extended a customer database, but was still aware that they are not reaching a full booking potential. From that point, Ionian Charter decided to join Booking Manager System in 2012 in order to offer their fleet to all major agencies and enable them to book directly. Reaching the leaders through the System had not only opened up opportunities on the global yacht charter market but also dramatically simplified communication with clients. 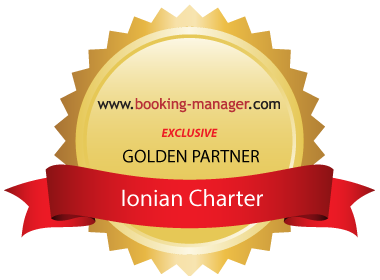 Ionian Charter has chosen Booking Manager as the unique business solution to organize their entire back office work. As a MMK Golden Partner who is exclusively offering their fleet in Booking Manager, they have been using the System to organize check-in procedure, create advanced financial reports and track all the important details about any booking. Moreover, Ionian Charter uses smart System features to track booking history of each client which supports their key value and future goal- to sustain a service model that customers keep coming back for. For more information visit Ionian Charter website.